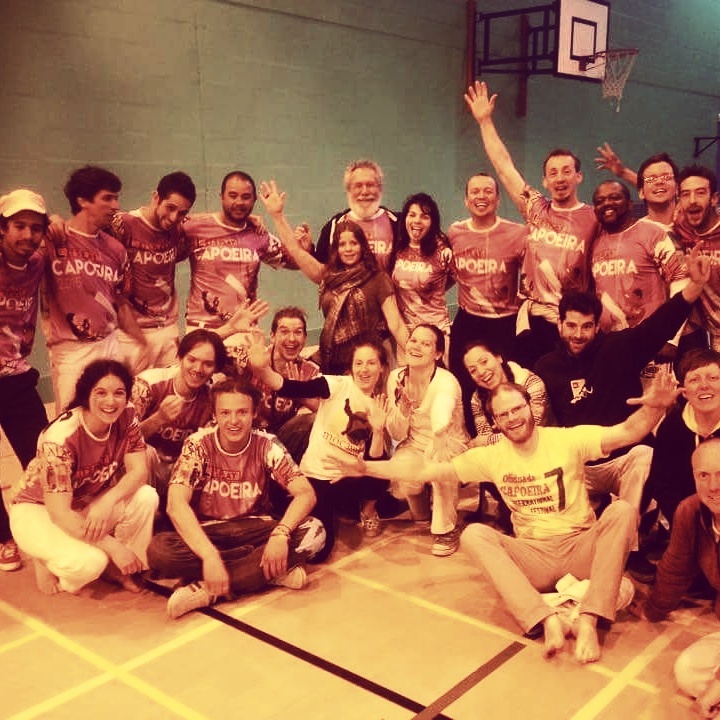 Last weekend I was fortunate enough to be able to make it to Mestre Maxwel in Swansea for Let’s Play Capoeira 2015. I first went to Swansea in 2013 for another Let’s Play Capoeria event which was held in honour of the fact that Mestre Acordeon was visiting the UK ahead of his 70th birthday and plans to cycle from Berkeley (where he is currently teaching capoeira) to Bahia in Brazil in order to gain experience for a script about capoeira that he is writing, and raise money for his charity in Bahia to help disadvantaged children have safe learning environments. The B2B project website is here. Accompanied by his wife and some of his students, he cycled through eleven countries, stopping in more than 30 cities, experiencing the local capoeira culture and sharing his knowledge. As a young capoeirista, the event in 2013 was one of the first I had attended, and it was fantastic. As I have said in previous posts, learning from and speaking with a variety of mestres is always hugely rewarding, and especially so when one of those mestres is Mestre Acordeon. He is one of the oldest living mestres and trained with Mestre Bimba, the founder of capoeira regional. Being old is of course not a good enough reason to venerate someone, but Mestre Acordeon lives and breathes capoeira, taking the philosophy of the game into his life. His thoughts on this are too eloquent and complex to try and recount here. One thing he said that really struck me was about the sound vibrations of the bateria – the musical ensemble that controls the roda (the circle in which we play capoeria) – and attuning yourself to these sounds. Music is a key part of capoeira, so this is essential, but also, with everyone participating in the roda attuning themselves to the same rhythm, it doesn’t matter what else is going on in each individual’s life, it brings you all to the same place, and the same tune. Chatting with a friend at the event, we though that this part of capoeira is like the meditative part of yoga, it takes you out of yourself to concentrate on the moment. Mestre Acordeon is such an inspiration, and it was a pleasure to spend time with him. All the mestres at the event were fantastic – Mestre Maxwel himself, Mestre Mago, Mestre Buiu and Mestre Aranha. We also did an amazing Africa dance session with Teco Caninde – it really gets you in the mindset of how to move!. Alongside learning essions with these great mestres, it was also just wonderful to spend the weekend with a group of people who share my love of capoeira, just bonding and enjoying ourselves. I also learn just as much from the students, seeing the different ways that they play and think. I always walk away from these events re-invigorated to improve myself and both personally (as an overall person and as a friend) and as a capoeirista, and this has been no exception. I have also come away obsessed with a song composed by Mestre Buiu – I must figure out the lyrics to share with the rest of the group and add to our repertoire! 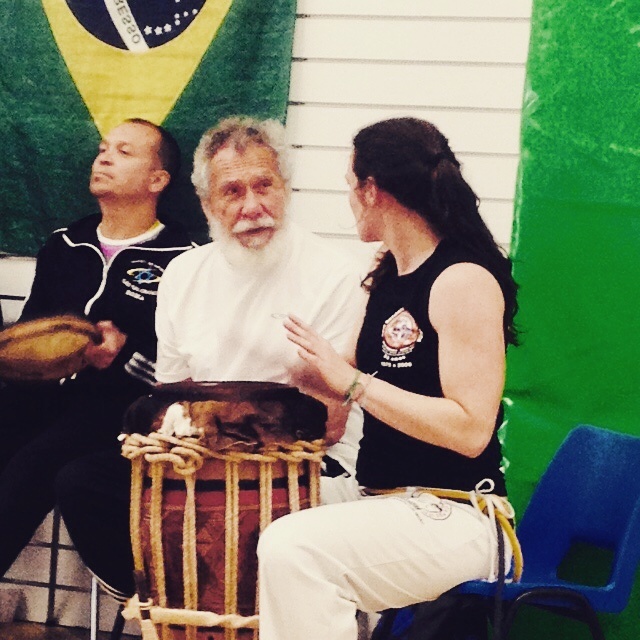 This entry was posted on June 3, 2015 by Jessica Suess in Capoeira.